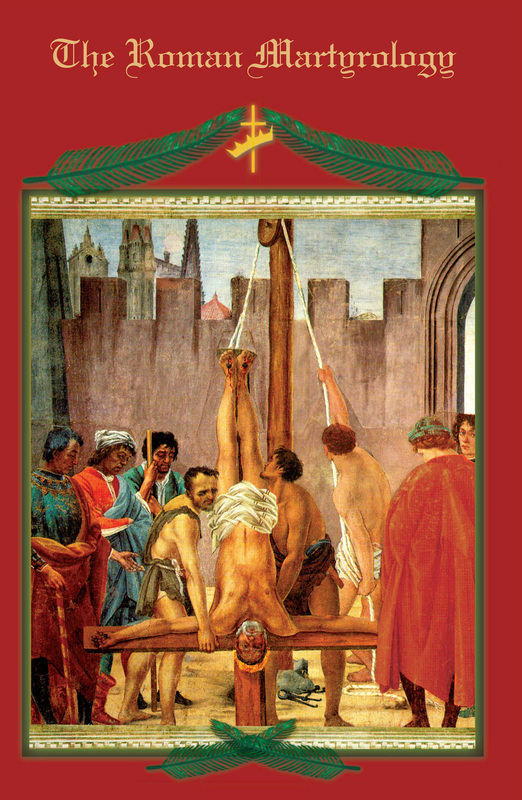 We have chosen to re-issue the Third Turin Edition of the Roman Martyrology for many reasons. Among them are the nobility of its style, the serene chastity of its language, the continuity of its ancient lineage, and the fact that it is essentially the same text read by countless souls over the centuries on their pilgrimage to the Eternal Jerusalem. In a word, tradition. You will not find listed here the numerous saints canonized over the last sixty years. This may be unfortunate but some lack cannot be avoided; there are other sources and newer calendars. The historical importance and the spiritual value of this edition is inestimable. We hope that this offering from Loreto will fill the desires of many souls who will know best how to utilize this volume to their advantage. This 20th century may well have been the bloodiest in the long and glorious history of the Church of God upon earth. Remember that the blood of the martyrs is the seed of the Church. God willing, we will reap a bountiful harvest of souls in the 21st century. May the example of those who have already tread the path of the cross, fortify our souls, give us courage, and provide hope that we too may have the grace to receive, with grateful affection, whatever end the providence of God has destined for us. "We have the names of almost all the martyrs arranged according to the days on which they suffered, collected in one volume, and daily we offer Masses in their honor. This book does not tell us to what extent each one suffered but only his name, and the place and the day of his suffering is recalled. And so it happens that many from different lands and provinces are glorified with the commemoration of their martyrdom each day." Pope Saint Gregory I, July 598 A.D. There are two lovely anecdotes which Saint Thérèse relates in her autobiography. Both events occured on the pilgrimage she and her family made to Rome in 1887, just ten years before the end of her earthly sojourn. The first concerns the stop they made at Loreto to visit the Holy House of Nazareth. Celine and she would not be content to receive communion in the Basilica, they would have Our Lord come to them in Mary’s house. How fitting and how touching that it should be so. The other is the famous story of how they courageously and boldly leapt to the floor of the Coliseum, against all rules, to kiss the soil soaked with the blood of the martyrs. Such divine impertinence! Such childlike enthusiasm! Such unearthly impatience! Of this spirit are all the martyrs of our holy faith. The spiritual child, like any earthly child, must have what it desires, nothing less, and quickly. No, heaven cannot wait for us, nor can the saints wait for heaven. Herein are the names of countless souls who have finished the race and fought the good fight. All have received their eternal reward. Pray that we do likewise.